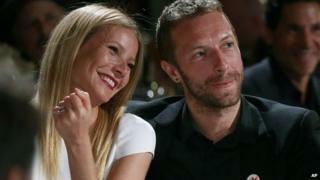 Hollywood actress Gwyneth Paltrow and Coldplay singer Chris Martin are to separate after more than 10 years of marriage, the couple have said. Paltrow, 41, and Martin, 37, announced the split on her blog in a post titled Conscious Uncoupling. "It is with hearts full of sadness that we have decided to separate," the couple wrote. The pair, who married in December 2003, have two children - Apple, nine, and Moses, seven. A spokeswoman for the Coldplay frontman confirmed the split, the Associated Press news agency reported. In the message on the actress' blog on the website Goop.com, the couple said they had "come to the conclusion that while we love each other very much, we will remain separate". The couple said they had been "working hard for well over a year, some of it together, some of it separated, to see what might have been possible between us". "We are, however, and always will be a family, and in many ways we are closer than we have ever been," they wrote. The statement was also accompanied by a photograph of the couple, as well as advice on marriage, divorce and spiritualism from two doctors. In a lengthy essay titled On Conscious Uncoupling, Dr Habib Sadeghi and Dr Sherry Sami wrote about divorce as "a traumatic and difficult decision for all parties involved". "By choosing to handle your uncoupling in a conscious way, regardless of what's happening with your spouse, you'll see that although it looks like everything is coming apart; it's actually all coming back together," they concluded. The announcement comes after Paltrow and Martin moved to Los Angeles last year, having previously lived in London. In November, Paltrow spoke about plans to "uproot" her family again and return to the UK. Paltrow, who won an Oscar for best actress in 1998 for Shakespeare in Love, most recently starred in Iron Man 3. Martin, whose band Coldplay are due to release their sixth studio album this year, is set to appear as a mentor in the current series of The Voice in the US. The couple married at a secret ceremony in December 2003, days after they announced Paltrow was pregnant with their first child. They had already been together for a year, after reportedly meeting backstage at a Coldplay concert. Just what is 'consciously uncoupling'?